Contents: Noodles, greens, pork, broccoli. I'm not sure of the other items. Any ideas? Notes: The food actually looks really tasty. Looks like a blend of a lot of Asian cultures. Man, that's the best-looking lunch I ever seen on here. Ah, Singapore. tasty but not healthy... all lies! 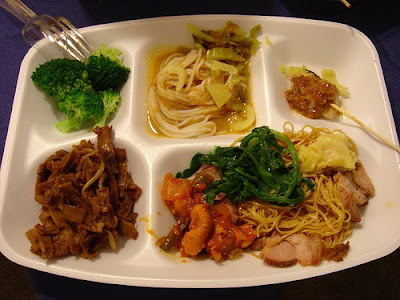 lol actually this photo might be a real school lunch in singapore but schools don't usually serve a full plate of fried food because it goes against the ministries of education and health guidelines.. they also don't usually serve plastic utensils either because washing metal ones are cheaper. this is not a typical singapore school lunch. This certainly isn't a typical school lunch for the standard schools that Singaporeans attend. From I see, going clockwise starting from top left corner of the tray, the food are 1. Boiled broccoli, 2. Rice vermicelli with celery, 3. a stick of satay (or sate), 4. a (non-standard) variation of won ton noodles (there's won ton, some roast pork, and a small portion of meat stew), and 5. char kway tiao (rice flat noodles fried with soya sauce). 3 types of noodles in one seating is simply unreal! ^ true! i dont get these in my school in sg. private school perhaps? Angelina, actually, we also would like to post about schhol lunch in Singapore. Can you tell us in a couple of words what an ideal scool lunch is in SIngapore? Also, if you have an pics of the food, can you send us them? I agree with most, rather, i would assume that if this is indeed a school lunch, this would be the school lunch for international school student! It also acts as a way to introduce some of the Singapore foods to the international student!